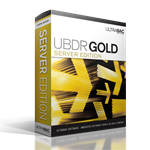 UBDR Gold represents the latest in disaster recovery technology. Gold can cold boot any machine and perform either an image or file based backup to literally any local or remote storage device, including media libraries*, TSM servers*, and FTP devices*. Back up all hidden and active partition types including 'extended' and live operating systems. Recover a "dead" machine in minutes (up to 7GB/min) by booting from a user created CD or USB key. Simply insert the universal media, boot, browse, click on the saved image, restore, and reboot. Perform dissimilar hardware restores with Gold's physical-to-physical (P2P) disaster recovery feature. In addition, UBDR Gold is the first Windows backup software to offer physical-to-virtual (P2V) based disaster recoveries. Along with support for virtual-to-virtual (V2V) and virtual-to-physical (V2P) recoveries, Gold provides users with every available disaster recovery option. Both the backup and restore process can be fully scripted for 100% unassisted recoveries. UBDR Gold can coexist with any backup solution as a stand-alone product, or it can be integrated with your existing UltraBac file-by-file backups. * Agents for TSM, FTP, and media libraries are additional cost options. For a more comprehensive overview, please view the UBDR Gold Product Sheet.